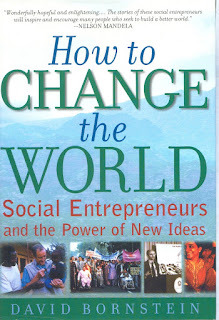 How to Change the World, Social Entrepreneurs and the Power of New Ideas, by David Bornstein is a book that explores a wide range of social entrepreneurs and the success and failure that they experienced in their endeavors. One of the main focuses of the book was Ashoka, an organization that scouts social entrepreneurs, and allows them to grow and flourish under their wing by funding and supporting them. By inspecting each case of social entrepreneurship, we are able to extract lessons of both failure and success, allowing us to be the best Social Entrepreneur we can be. Before reading the book, I assumed a social entrepreneur was just a person with an innovative idea. This is certainly part of the definition. Jeroo Billimoria is a great social entrepreneur in part because she has the ability to dream up a way to solve the problem she saw in her community cheaply and effectively. But the book also exemplifies the many other qualities of a successful social entrepreneur. For one, the vision must be met with with passion. Social entrepreneurs are “obsessive people who have the skill, motivation, energy and bullheadedness to do whatever is necessary to move them forward" (Bornstein, 94). They meet challenges with “boundless energy” (248) and refuse to take no for an answer. The impact on their own personal life and the recognition they may or may not receive is worth sacrificing for the greater good of their project. “To Monnet, people of ambition fell into two groups: those who wanted to ‘do something’ and those who wanted to ‘be someone’” (243). Social entrepreneurs fall into the first category. The last quality is that such a leader must be willing to look past the stigmas and prejudices in their own communities, such as the stigma against AIDS that Veronica Khosa encountered, and enable others to look past them as well. They must persuade their own communities that the old way is not necessarily the best way. In the end, these many qualities are just symptoms of something deep within them. As Drayton says, “I think the heart of it is that entrepreneurs, for some reason deep in their personality know, from the time they are little, that they are on this world to change it in a fundamental way” (125). Social entrepreneurs cannot survive without funding and support. Often, they will work with governments, and sometimes large firms. For Fábio Rosa and his project of delivering electricity to rural Brazil, the system already in place was not working. The system itself was designed by the government to help electric companies, and didn’t allow for many poor and rural families to have affordable access to electricity. In this case, Rosa had to first gain permission for his project by the government, as the solution he had discovered was technically illegal. Because Rosa worked with the government and electric companies, electricity was able to reach a vast amount of rural Brazilian farmers. Another example of working with government is how Jeroo Billimoria was able to work with the Indian government to spread Childline to almost every major city in India. Jeroo also employed police officers, and worked with the government officials to make sure every call was addressed. Sometimes using the government is the most efficient way to spread a program and achieve the vision of a social entrepreneur. Most of the social entrepreneurs that were interviewed in this book would not have been able to reach their full potential without the funding of Ashoka. For us as students, our “big company/government” is Northfield Mount Hermon. It is crucial for our our own social projects that we use everything the school has to offer. How to Change the World is a powerful look into the lives of social change advocates, and is a tool that allows us to think about our own roles in the field of social entrepreneurship. The book shares many impressive stories of social entrepreneurs. As exemplified in the first and second paragraph of this review, there are many qualities that make a social entrepreneur. As fascinated as we were by the characters’ stories in How to Change the World, we were also intimidated. These innovators gave their whole selves over to their work. We are high school students, just taking a class and attempting to imagine ourselves on the scale of these great entrepreneurs. As we take on this class and learn more and more about what it means for us to be social entrepreneurs, I hope that we will continue to make connections between the lessons in How to Change the World and our own journey of social change, and perhaps these stories will become more relevant to our stories. Although we felt these stories were at times alienating to young aspirers, How to Change the World was a fascinating and worthwhile view into the details and importance of the field of social entrepreneurship.